Use your ≤ftarrow; &rightarrow; (arrow) keys to browse. Click on the picture or link for the full tutorial. Your kids will love that these muffins are sweet, moist, chewy, and bite-sized. You’ll love that they are packed with vegetables and whole grains instead of tons of sugar. 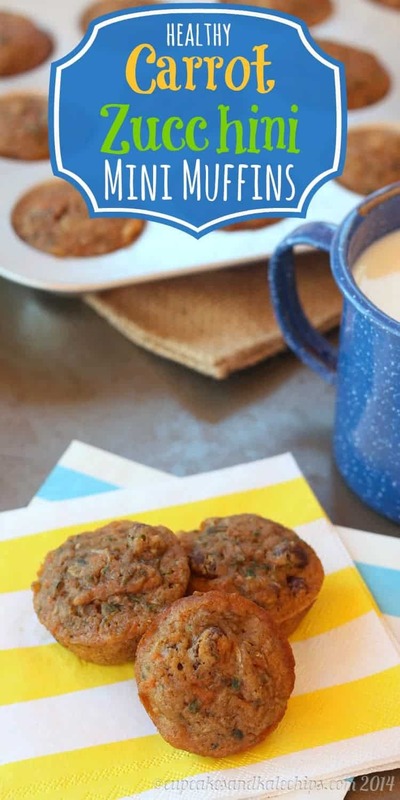 Whether you want a portable, poppable breakfast or tasty health snacks, with the spring and summer veggies starting to show up in gardens and farmers markets, it’s time to make a few batches of Healthy Carrot Zucchini Mini Muffins. MMmmmm, these are right up my alley. Those look so scrumptious and you gotta love a muffin that’s healthy, too! I am trying to recall if I’ve ever combined carrot and zucchini in a muffin or loaf and I don’t think I have and I don’t know why because the flavours are perfect together. Thanks so much for sharing! Two of my favorite veggies to make bread with! These look delicious! Do you think if I used the pulp from carrots after juicing for this recipe it would work? Or would it be to dry? They sound great! My only concern is the amount of maple syrup/honey. 1/2 cup is quite a lot of sugar. Does anyone think it would work if I did 1/4 c of maple/honey and 1/4 c of water instead? Made these yesterday with my 4 year old. They are GREAT-very moist!! We did add the whole 1/2 cup of maple syrup and they didn’t come out too sweet. I have regular whole wheat flour not white. Will that work also? These look great, but I don’t have a mini-muffin pan. If I use my regular muffin pan, any ideas on how the temp/time might need to be adjusted? These were so good I think my toddler and I consumed them all in a 24 hour period:o needless to say I am at least doubling the recipe this time. I am going to incorporate some rolled oats and possibly some banana, aaple sauce or pumpkin (haven’t decided). Thank you! 2010 – 2018 The Melrose Family. All Rights Reserved. Design by JudithShakes Designs Wordpress VPS.